Click here to download 2015 presentation slides. The 2015 Atlantic Biorefinery Conference has confirmed international speakers from a variety of backgrounds who will share their knowledge and experience with transforming natural resources into high value products. Presentation topics will address current developments in biofuels, bioenergy, aquaculture, marine, forestry, value-added waste streams, and regulatory. Presentations will be delivered in English and French. Live translating will be available on site. Following that, Ken launched Salveo Enterprises, an organizational project management company that provides government relations, strategic communications and planning services. Ken has been a leader in biofuels industry development, both provincially and nationally for the past 10 years. And in 2013, he was invited to serve as a Research Fellow at the Cape Breton University’s Verschuren Centre for Sustainability in Energy & the Environment. Ken lives in East Bay, Nova Scotia with his wife; they have one daughter and a grandson. Nicholas Savoie, Fibre Procurement Superintendent at Twin Rivers Paper in Edmundston holds a Bachelor Degree in forest management and MBA from the Université of Moncton. Nicholas is a Registered Professional Forester in N.B. and has enjoyed 17 years experience in forestry. He started in the woodlands forestry operations and was involved in planning, sylviculture, road building and harvesting. In 2008 he moved to the Edmundston pulpmill. Nicholas' current responsibility is fibre procurement, fibre sales and certification. In addition, to keep connected with the day to day reality of primary resources producer, Nicholas manages his own woodlots and small oyster farm. Eric Camirand, President of Electrigaz Technologies Inc.
Mr. Camirand holds a degree in Electrical Engineering (’93) from McGill University in Montréal. Since 2002, Mr. Camirand has been active in the renewable energy sector by contributing to various organizations such as the Canadian Wind Energy Association (CANWEA), Biogaz Québec and more recently as a board member of the Association québécoise de la production d’énergie renouvelable (AQPER). In 2005, Mr. Camirand founded Electrigaz Technologies an engineering firm specialized exclusively in the study, design and realization of biogas energy systems. Based near Montréal, Electrigaz delivers biogas engineering and project development services worldwide to various clients such as food processors, farmers, waste management companies, government agencies and municipalities. As President of Electrigaz Technologies, Mr. Camirand is leading a young and passionate team of engineers dedicated to find solutions to the 21st century energy and environmental challenges. Chris de Visser is an agronomist by education and has been working in the field of applied research on arable crops and field production of vegetables for over 20 years. Since 2007 he has been active in the field of the bio-economy as project developer and manager. He has designed and developed ACRRES in Lelystad, the Netherlands, as an application centre for renewable resources. The centre now operates a test mill facility for 14 windmills, a solar panel test site with different panel types and systems and near-commercial scale facilities such as a codigester of 1,000 m3 with a CHP, two open pond algae cultivation reactors, a bioethanol plant and a green gas production plant. ACRRES co-develops practical innovations together with private companies and knowledge institutes. ACRRES is active in small scale biorefinery technologies on separation, isolation and use of proteins, sugars, starch and high value molecules from plants, aquatic biomass or waste streams. At the moment the centre provides work for 6-8 full time employees. Simon Barnabé is an industrial microbiologist with a Master’s degree and a doctorate in water sciences from the Institut national de recherche scientifique. Dr. Barnabé was a scientific consultant for various organizations and municipalities before becoming professor in the Department of Chemistry, Biochemistry and Physics at the Université du Québec à Trois-Rivières (UQTR) in Trois-Rivières (Québec). He is a member of the research centre on lignocellulosic material at the UQTR, holds the UQTR Foundation’s Industrial Research Chair in Environment and Biotechnology (CRIEB) and jointly holds the Industrial Research Chair in Regional Bioeconomy and Bioenergy (RBB). His research activities are dedicated to relaunching regional economies and revitalizing local infrastructure and expertise through diversification of biomass products. Dr. Barnabé has more than 30 university, collegial, municipal and private collaborations locally and internationally, and has developed nearly 20 industrial partnerships. With over $3 million in research funding since 2008, Dr. Barnabé and his research agent Kokou Adjallé now lead a team of about 20 university undergraduate and graduate students and postdoctoral students while piloting multisectoral projects in emerging sectors of biomass and industrial bioprocesses. Watch a short video about Dr. Barnabé and his team by clicking here (French only). 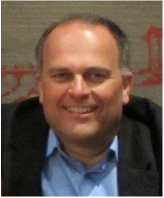 Hans van Klink has a financial economics background and is Director Project Development in Dutch Sustainable Development BV (DSD). Since the mid 1980’s he has been involved in business development in the agri-food industry. He has been active as business development manager within R&D projects and establishment of joint ventures and/or new companies in all European countries, Africa and North America. Since 2002 he is active with his own company, DSD. One of the main objectives of this company is to develop concepts and methodologies for sustainable agriculture and optimize the food processing chain. Furthermore he is active in developing concepts that are new in the Biobased Economy and that are opening new prospects for farming communities, but also linking agriculture with chemistry. DSD is involved with its technologies (Betaprocess and NewFoss) in several R&D projects with ACRRES, Wageningen UR and other scientific institutions. 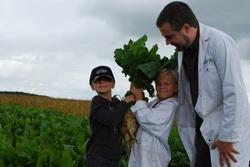 One of the projects in which DSD is involved, together with ACRRES, is CHEMBEET, a demonstration project for direct processing of sugar beets into bio-ethanol. Marco Volpé holds a B.Sc. 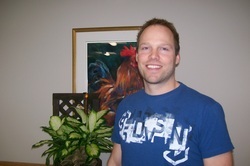 (Agr) from Laval University (2003); and a M.B.A. from de Université de Moncton (2014). Since he started working in the poultry industry in 2003, Marco has worked extensively on bird health and environmental issues surrounding poultry operations. In 2006 he joined Groupe Westco where he was brought in to play a role in the expansion and diversification of the business. Over the years Marco has had the privilege to manage many of the company’s projects, several of which involved dealing with reducing the environmental footprint and adding value to the massive amounts of the various biomasses the company deals with. Marco is currently the Chief Agronomist and Assistant director of operations for Westco Group. Topic: Marine Bacteria, What are they Good for? Dr. Forward is Head of the Food, Fisheries, & Aquaculture department at the New Brunswick Research & Productivity Council (RPC), in Fredericton, NB, Canada. 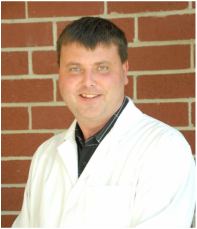 He holds a PhD in Biochemistry from the University of Victoria and a BSc with honors in Biology from the University of New Brunswick. He joined RPC in 2006 as a senior scientist after coordinating the university programs at the Huntsman Marine Science Centre and serving as a postdoctoral fellow at SynGene Biotek. As Department Head he oversees three divisions providing R&D and diagnostic services in the areas of Fish Health, Microbiology, and Forensic Biology. He has served as project lead on numerous applied molecular and microbiological R&D projects including several with a focus on practical applications of marine bacteria. Over the years, this work has established a marine bacterial library containing approximately 2000 culturable isolates along with high throughput screening methodologies for the identification of bacteria with desirable traits that include antibacterial, antiviral, agarolytic and anticancer activities as well as isolates used as marine probiotics for finfish and shellfish. Dr. Forward is a board member of the Atlantic Canada Fish Farmers Association, an adjunct professor at UNBSJ, member of the Canadian Society of Forensic Science, Society for Wildlife Forensic Science, and Aquaculture Association of Canada. Christopher Hooper, President and CEO, Cellufuel Inc.
Chris is a native of New Brunswick and is returning to Canada after spending several years in the US to run a clean-tech start-up based in Halifax, CelluFuel Inc. He is a graduate of Dalhousie University, the Technical University of Nova Scotia and Saint Mary's University completing science, engineering and MBA degrees. His broad base of experience encompasses industrial, manufacturing, power (fossil & renewable) and private investment sectors, amongst others. He has held senior leadership roles in operations, business and corporate development, corporate strategy, general management and portfolio investment management with companies including Stora Enso Oy, NewPage Corporation, Cerberus Capital Management and JD Irving, Limited. Jean A. Bourque is a Director with the North West Regional Service Commission, a community managed group that provides solid waste and urban planning services to North West New Brunswick. NWRSC operates a sanitary landfill site that manages many recycling programs and builds awareness in schools and communities. Mr. Bourque has been responsible for solid waste management in North West New Brunswick since 1991, but is originally from Rosaireville in the South. He holds a Bachelor of Forest Science from l‘Université de Moncton and a Certificate in Human Resources Management from the University of New Brunswick. Jonathan graduated from NBCC in Business Technology. He has been with Groupe Savoie since 1999. Jonathan had various responsibilities such as shipping, sales, plant manager and since 2011, Vice President Sales and Development, Sits on different boards such as the Forest Product Association of Nova Scotia, the Atlantic Council for Bioenergy Co-operative and the Wood Pellet Association of Canada. As a graduate of the University of New Brunswick and a Registered Professional Forester, Allan has worked in forestry and natural resource management related areas for almost 35 years. He has worked extensively with resource management issues for both Federal and Provincial levels of government as well as the private sector. In the last several years, Allan has been deeply involved with the forest Industry helping to manage transition issues associated with mill closures in both Port Hawkesbury and Liverpool. Allan has been with the current Department of Natural Resources since July 2008 and was appointed Associate Deputy Minister in April of 2013. Among other things, his current responsibilities include Forestry and Forest sector innovation and transformation. Joey Volpé holds a B.A. in Industrial Relations from McGill University as well as a Law degree and a Master’s in environmental studies from the Université de Moncton. Joey’s career has led him to working in the private and public sector as well as in academia. In the private sector, he mostly worked in human resources and communications for multinational companies in the area of natural resources. He also holds a decade of experience as a professional researchers. During his stint in academia, he studied questions related to legal frameworks for the forestry industry. He also worked as a Development Officer for the Edmundston Region Chamber of Commerce, a position he then held for the Province of New Brunswick. Since November 2014, he has been an Industrial Liaison Officer in the Research and Industrial Services Division of the Collège communautaire du Nouveau-Brunswick and represents the institution at Springboard Atlantic. Kevin Shiell holds a B.Sc. (Agr) from Dalhousie University Agricultural Campus (1994); and an M.Sc. from the University of Saskatchewan (1996). He began working for the CCNB in 1998 as an instructor in the former Biotechnology Laboratory Technicians Program. In 2004 he began conducting research on producing value added products using fermentation with a focus on bioenergy (ethanol and biogas). In 2010 he became part of the newly formed applied research centre located in Grand Falls. The Biorefinery Technology Scale-up Centre was formed as a direct result of investments made by the provincial and federal governments and NSERC in applied research at community colleges. Mr. Shiell remains a part time researcher and project manager at the Biorefinery Technology Scale-up Research Centre. In 2013 Kevin took on a new challenge as the business development and sales manager for Complete Senergy Systems, a biogas technology company located in Grand Falls. Ron Coles is the Vice President of Agricultural Resources and General Operations at Atlantec BioEnergy Corporation (ABC). As an Islander and a graduate from the Nova Scotia Agricultural College, Ron has spent his professional career straddling both the public and private sectors in PEI and Nova Scotia. With over twelve years experience in the dairy management sector in Atlantic Canada coupled with his professional experience at the PEI Energy Corporation, Ron has developed the perfect mix of business expertise and innovative thinking to take advantage of a burgeoning sector. In 2007, ABC was born - now almost 8 years later, ABC is in the middle of commissioning a STDC (Sustainable Technology Development Canada) project which will see them emerge as a premier technology provider to the ethanol and bioenergy industry. ABC currently owns and runs a 300,000 litre/ year ethanol production facility in Charlottetown PEI where they are refining their design and process technology to supply and support commercial based plants in North America.